Akram Zaatari, Beirut Exploded Views, 2014. A comprehensive exhibition of works by Akram Zaatari, an artist from Lebanon, has opened at SALT Beyoğlu, Istanbul, on December 2, 2014. The exhibition includes a selection of videos, photographs, and installations that the artist produced between 1998 and 2014. Spreading over three floors of SALT Beyoğlu, each floor is built on a different key theme in Zaatari’s practice, taking on the representations of digging, exposing, and preservation through the prisms of archaeology and archival photography. Starting with the video Beirut Exploded Views (2014), which inspired me to write this article, I’d like to relay my impressions of this exhibition. 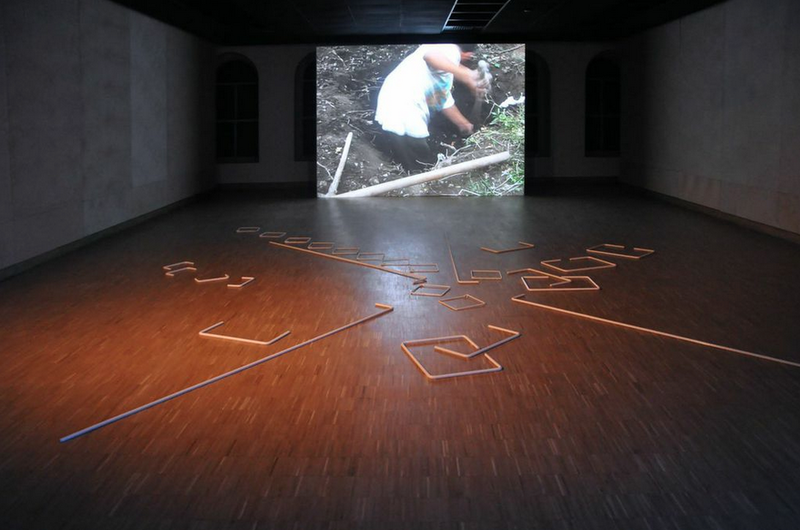 Installation view from Akram Zaatari, SALT Beyoğlu, Istanbul. Beirut Exploded Views (2014), installed on the third floor of the exhibition, has been filmed at a number of unfinished construction sites. The spaces between these locations and the angles of shooting give viewers the impression that these are incomplete spaces. 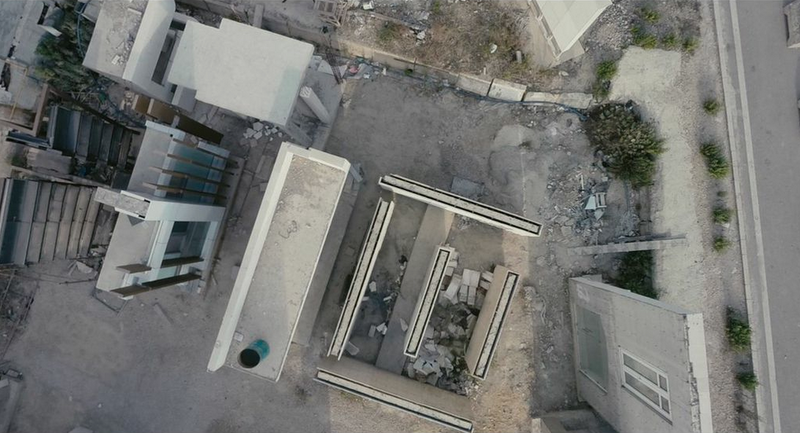 Near the end of the video, the perspective of the camera shifts up and in a bird’s eye view, it is possible to see that these spaces are fragments of constructions that almost seem to have been built for a film set. The protagonists of the video, all of whom are men, aimlessly spend time in these empty spaces, filling their time by playing with cell phones, trucks approach, the scaffoldings are lowered, but there does not seem to be any construction happening. This work by Zaatari from 2014 evokes the viewers to think about the “eastern” concept of time and space. Between functionless spaces and “impoverished” free time filled with purposeless activities, we encounter a time-space relationship that is specific to this locale. In societies that we could dub “eastern”, where daily life is not as “organized” nor as administered as in the West, where there are not as many rules, time is a completely different notion. 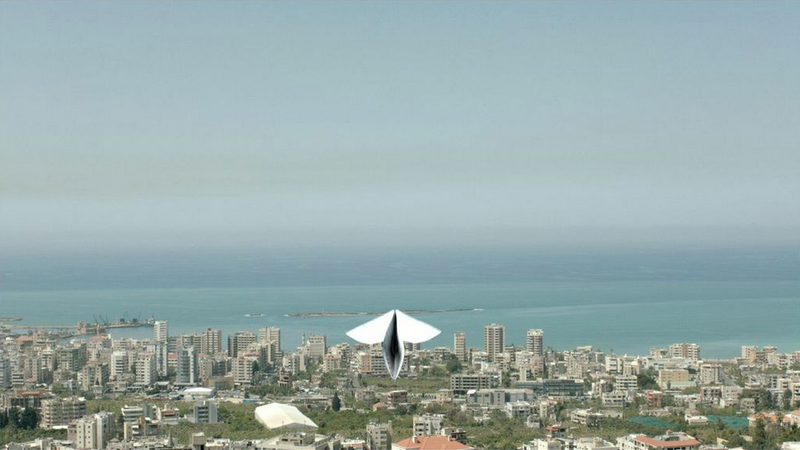 In Zaatari’s video, “time” is changed through cell phones; technology and the body become spatial. The floor mattresses that are scattered in the empty public spaces, the construction workers who appear to be about to work, but who are not working, the policemen that mysteriously come out of nowhere, wandering, boundaries between public and private, concepts of labor and free time disappear, forming an ambiguous story. Bodies that move in functionless spaces and who are only talking on the phone become theatrical elements, forming their own detached choreography. The fragmented images of the spaces left to their demise almost mirrors the recent wars of Beirut, a city that suffered numerous political and military conflicts over the course of its history, attempts to have peace and the identities that are constantly interrupted. The video in which the characters and the space are ambiguous, people foreground technology as a tool of realizing their dreams, hinting at the projection of a incommunicative individual of the future. The third floor is formulated around the body and acts of posing; the sub-theme is “free time.” “The relationship between the telephones and music in Beirut Exploded Views is extended here through the use of the Internet in the four-channel video installation Dance to the End of Love (2011). The elements that define free time in the videos are “technology” and “watching.” People can pass their time by connecting to the Internet on their cell phones, listening to music, playing games; they can also upload others pass-times such as car races, bodybuilding, singing. In this sense, the Internet space is a depository of contemporary memory. The artist is interested not only in the historical data of “recording” and “watching” and his own documentary practice, but also in the contemporary forms in which people record. The most common recording and hobby device, the camera, has now been replaced by cell phones, which also feature video-recording. Internet and social media produce a collective watching and being watched experience as the “moments” of social life can be simultaneously shared. In an era when print newspapers are becoming obsolete, the portrait photograph is replaced by the “selfie”; individuals are able to share their daily experiences as journalists, reporters, and/or travelers: the act of “recording” is being transformed into a contemporary practice that is independent of professional specialization. At this point, “technology” enables and provides many opportunities for the recording and reproduction of infinite images. Zaatari’s work Dance to the End of Love departs from archival material depicting this multi-dimensional medium in the four-channel video. This time, the archival medium of the Internet and the producers of this archive are regular people that we encounter every day. Zaatari is one of the founders of Arab Image Foundation (AIF) and has enabled the archive of Studio Shehrazade to become a part of the institution. 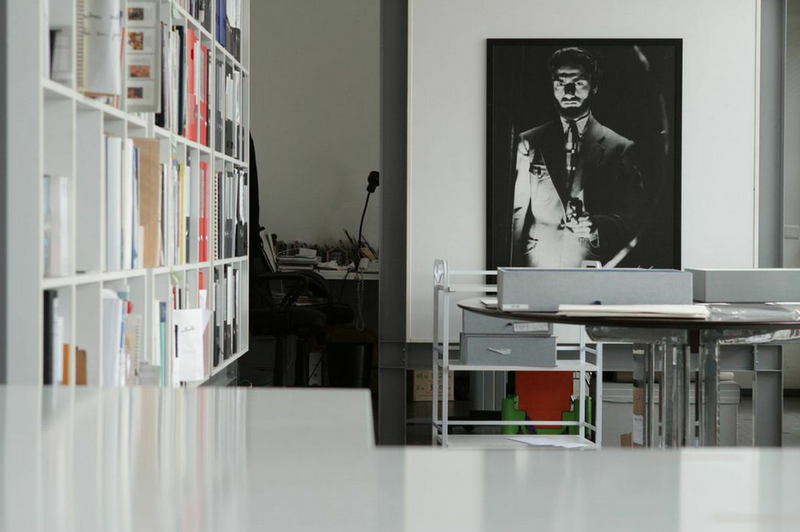 The Studio Shehrazade Archive, which has been central to many of Zaatari’s works, and photography are the defining threads of the second floor of the exhibition. Studio Shehrazade – Reception Space (2006) is made up of three large photographs printed on a black background. These photographs taken in Studio Shehrazade, tools scattered across the table and in the cupboards, are later organized and categorized in other works that follow it. In Zaatari’s work, the means of producing photographs are archived and organized as well as isolated from their context and transformed, just like the photograph itself. Devices of recording, microphones, cameras, cables, cassettes, pencils constantly reappear in Zaatari’s work as indispensable elements, forming their own readymade aesthetic through “his” touch. What is on our table, the tools and devices that we go to all the time, form our portrait. Through the works on the second floor of SALT, it is possible to see the clues to Studio Shehrazade and Madani, the artist and the portrait of the artist himself as an archivist. In the video Endnote (2014), the founder of Studio Shehrazade, photographer Hashem el-Madani, and Akram Zaatari are next to each other and look at a computer screen. We cannot see what they are looking at, it is as if what they are watching is endless. Two colleagues, one of whom has dedicated years to photographing, to preserving his archive; the other organizing the archive that the former accumulated over many years, producing knowledge around it, a documenter and an artist. While one of them is wearing a shirt and tie, the younger one, Zaatari, is wearing a hooded sweatshirt—like a child ready to learn from the previous generation. Arabic melodies are in the background; the only thing that moves is the “light’ behind the two colleagues, blinking, extending, shortening, changing colors. Light, which is the fundamental element of photography, is what defines one of the main motifs of the works, “time.” While we watch these representatives of two different generations sit next to each other, it is as if the two of them are watching the people who have been photographed, the world, with soft smiles on their lips. Endnote is based on a single scene. While the work appears to be unassuming, it triggers many thoughts on photography, video, moving or still images and viewing. Zaatari constructs Endnote on a single image that resembles a still image, a photograph, always at the core of his works. Akram Zaatari, Letter to a Refusing Pilot, 2013. The exhibition is constructed of repeated images. Zaatari presents himself in many of the works in one form or another. Zaatari is watching the computer screen in Endnotes with his master; in Untitled (2010) he is watching Madani make a trial shooting with an expired 8mm film and Zaatari is recording this trial. Zaatari is not fully present in On Photography, People and Modern Times and Letter to a Refusing Pilot, but his gloved hands are. The “hands” that bring together, converge, organize, work and the “gloves” that cover up these hands in order to protect the archival material from the harms of the outside world. The “glove”, present in numerous works, expose Zaatari’s principle of working meticulously, clinically. The repeated image of the hand seems to symbolize a position against the deconstruction of the “hand” and manual labor due to the progress of technology and industrial production. The “letter” as a means of communication is one of the symbols that Zaatari employs in his work. 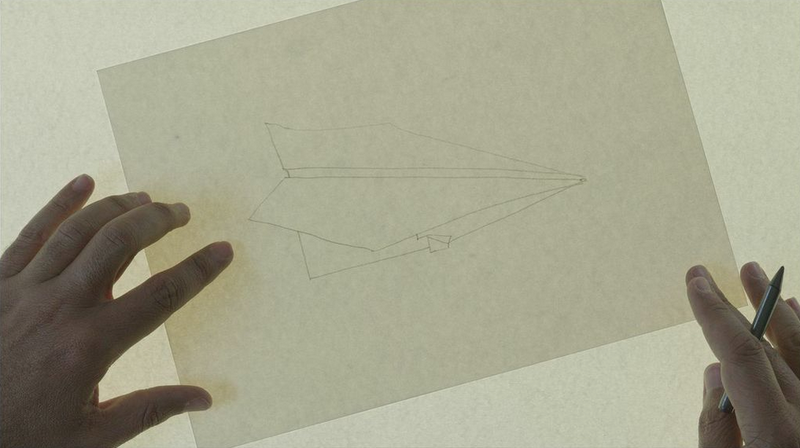 Letter to a Refusing Pilot (2013) has taken on the form of a letter written to a pilot who decided not to bomb the boys’ school that the artist’s father had founded. Letter to Samir (2009), displayed on the first floor of SALT, and Letter for a Time of Peace (2007) take as their subject matter a letter that Ali Hashisso, a Lebanese communist resistance fighter, wrote to the owners of the house he sought shelter in, hiding the letter in a cannon ball that he buried in the garden. Zaatari, in Time Capsule (2012), commissioned by dOCUMENTA 13, begins with the somewhat radicalized instinct of preserving the collection of the Arab Image Foundation—the institution that he is a co-founder of. He symbolically buries the archive in a structure made of concrete and iron. Just like the cannon ball and letter that Ali Hashisso buried in the garden, Zaatari buries the photography archive in a structure made of iron and concrete. As the underground preserves all kinds of archaeological objects from the past, it is also the safe space where the hopes and desires sent to the future are preserved. In A Photographer’s Window (2013), the window that appears to be one of the photographs and cars that are seen through the window that we saw in the three photographs taken in Studio Shehrazade – Reception Area are transformed into moving images. The television and the computer screen emerge in many works by Zaatari as tools of viewing. While the window forms a frame for the street view, the television or the computer screen take the recorded image within the frame. As I had mentioned before, the means of production of photographs and videos—cameras, microphones, cassettes—as well as every “frame” that impact the showing and viewing of the produced images such as a television monitor and a computer screen, are indispensable elements in Zaatari’s work. On Photography, People and Modern Times (2010), a two-channel video displayed on the second floor, is constructed on a comprehensive visual language that touches on the relationships between the aforementioned elements. Akram Zaatari, On Photography, People and Modern Times, 2010. The first floor of the exhibition is around the theme of archaeology. My impression from this floor is that this is the source of all the actions that seep into Zaatari’s works, starting with curiosity, digging, researching, exposing. Zaatari approaches all types of archival material, such as photography and video, like an archaeologist. As the pilot in Letter to a Refusing Pilot who refused to bomb a school at the last minute: “Constructing a city takes a lot longer than bombing a target.” We can construct a sentence based on the parallel between pulling the trigger and pressing the shutter, “Forming a photography archive takes a lot longer than taking a photograph.” Archives are like glue that connects us to both the future and the past. Zaatari says that concerns to preserve and protect stem from the desire to sustain life and love. I think that Zaatari’s instinct to protect, to archive, to expose is related to the civil wars that he experienced from an early age. Preserving the damage on archival photographs as a layer, bringing out the bullet and the letter that accompanied it underground, symbolically burying the photograph archive underground, the interviews conducted with the owners of the photographs, a war pilot spontaneously deciding not to bomb a school—all of the themes are related to exposing and preserving records taken of “space” and “time”, authored by an artist molded by war. An earlier version of this article was published in Agos, December 2014. The exhibition of works by Akram Zaatari took place at SALT Beyoğlu, Istanbul, December 2, 2014–February 15, 2015. Posted in content, on artists and tagged Akram Zaatari, Beirut Exploded Views, Letter to a Refusing Pilot, On Photography People and Modern Times, Pınar Ögrenci, SALT Beyoğlu, İstanbul. Bookmark the permalink.